Last Saturday after a long bike ride with some friends, we realized that we had found the biryani that would wear the yellow jersey. It started like this: husband’s aunt kept mentioning a place called Kadiris in Hendon. As I had already tried a restaurant of the same name in Willesden I spoke knowledgably of the food with her and thought that was that. And then a couple of weeks ago, I actually passed by Kadiris of Hendon, as they call themselves, and was intrigued. And thus it was that we found ourselves in this little shop collecting a chicken biryani from the extremely polite young man at the counter. The husband took one whiff and bitterly declared to me that this was going to be THE biryani – bitterly because he was going out for dinner with the boys and was shocked that we had the temerity to enjoy ourselves without him. After a quick fistfight at home to get rid of the husband and his tasting spoon that was making great inroads into our biryani, the son and I settled down to enjoy – wait for it – the BEST BIRYANI I HAVE EATEN IN THIS COUNTRY SO FAR. It was superb and tasted pretty much like the biryanis I have had in Bombay. It was so good that words fail me actually – which is pretty sad for a food blogger, right? Anyway, here is how it scored on the old biryanometer. Meat/veg harmony –5/5 – I could give them a 6 here actually! Yes, ladies and gentlemen – a 5/5 (overlooking the lack of potatoes – my mum fried some for us). I have found my local biryani – but has the quest ended? 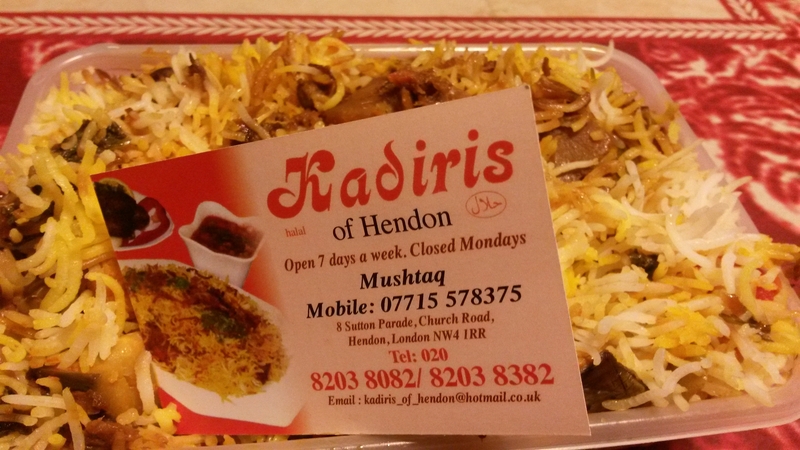 Of course not – Kadiris of Hendon has a veg biryani that I want to try out and a fish biryani only on Thursdays. And after that – what if I am in central/south/west London and get a craving? This entry was posted in Biryani and tagged chicken biryani, Indian food, indian restaurants in hendon, Indian takeaway, Indian takeway, Indian veg biryani, Kadiri's, Kadiris of Hendon by Poornima. Bookmark the permalink.